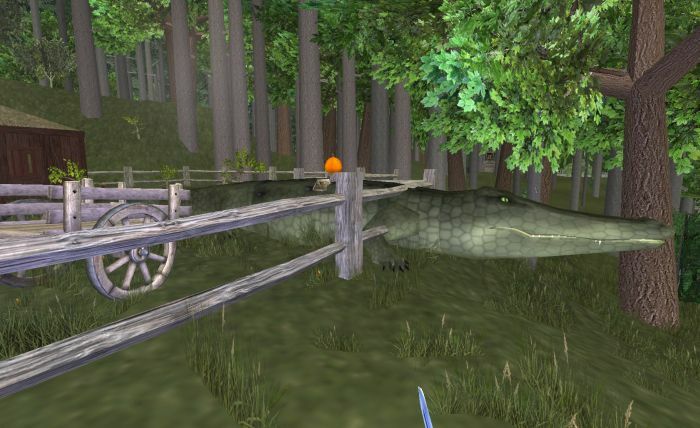 A Girl and Her Gator #WurmOnline – Nomadic Gamers, eh! I was walking home from visiting Arkenor yesterday when I spotted this (really hard to miss) incredible creature right in the middle of the road. A champion venerable crocodile! She was beautiful to look at, her girth covered the entire road and because I was wandering by on my Fo priest, she didn’t attack me. Of course, I had to bring her home. I convinced Moumix to wander over and tank the creature for me while I cast charm (18 seconds is a long time to get hit by a champion creature), thanks to his tanking, she was loyal, and mine. I brought her back to the pen pictured above, which she now happily shares with my rooster.